Many people go to the theatre simply to be entertained. They want some brainless musical, lots of leggy girls and guys kicking and dancing. The same phenomenon occurs at the movies — the popcorn flick, the meaningless comedy or action adventure film. These are, to use the expression from [title of show], donuts for breakfast. They are filling at the time, but leave you hungry an hour later. But at other times … at other times … theatre soars. It takes you to some other place, some other time, and leaves you talking and questioning. You leave not only entertained, but educated. You’ve thought critically. You’ve learned about an issue. You engaged your brain. Shows such as these are memorable, from 1955’s Inherit the Wind to 2004’s Doubt to the recent Gospel according to Jefferson, Dickens, and Tolstoy: all demonstrate the power of theatre to engage and make you think. Last night at the The Colony Theatre (FB), we saw another play to add to that list: The Best of Enemies by Mark St. Germain. The Best of Enemies tells the true story of C.P. Ellis and Ann Atwater. C.P. Ellis, at the time of the start of the play, was the Exaulted Cyclops of the Ku Klux Klan (KKK) in Durham NC. Atwater was a prominent black civil rights leader in the same community. As 1971 started, Bill Riddick was sent by the Federal Government* to handle the long-delayed desegregation of Durham schools. To do this, he organized a series of charettes to bring the entire community together to solve the problem. Riddick realized that the charettes could not succeed if the entire community was not behind them — meaning not only the black community or those in favor of civil rights, but those — such as the KKK and its factions — that opposed segregation. He therefore worked to get Ellis and Atwater to chair the Durham Charette — called Save Our Schools. He had no idea of whether it would succeed or fail. This play is the story of that effort. In the opening scenes we get to know both Ellis and Atwater, and see Riddick wooing them to get them to co-chair the group. Eventually they agree, and the middle of the play is that effort: the early days of the charette, the fights, and how they slowly learned to work together. The end of the play is perhaps the most unlikely: it shows how Atwater and Ellis became strong friends, there for each other. There were a number of points made in the play — all of which are quite important. First, there is the personal transformation of Ellis and Atwater. Let me give an analogue. On the way to the theatre, we were listening to a recent Gastropod on Cilantro Hatred. As you know, some people love cilatro. Others hate it. There is a theory that with enough exposure, you can learn to tolerate it. One thing this played showed is how — with exposure to each other from the committee — Ellis and Atwater got to know each other as people, to see their circumstances and their family, so see how they had quite a bit in common. I believe it was this unconscious effort of moving past the hate — eating the Cilantro Pesto, so to speak — that enabled them to become friends. The second point in the play — which is relevant today — was the revelation that the problem in the schools really wasn’t black vs. white. The problem was that the poorer kids — black or white — got a significantly worse education than the wealthy kids — black or white. Both Ellis and Atwater came from poor upbringings, and this revelation showed how the wealthy were exploiting the race hatred to distract from the class distinction. This was 1971 folks. It could never happen today. People exploiting race hatred to distract from class abuse. C’mon. I think this is why the play resonated in the way that it did: this historical true story of people coming together demonstrated that the problems are still there to be fought, and we have learn how to do with Ellis and Atwater did: move past the hatred (which is now based on political divisions) and work together to address problems. In short, this is a play that everyone should see. But be quick. It only has a few performances left. And speaking of performances (how’s that for a segue): the performances at this show were uniformly excellent. Under the direction of David Rose (FB), the performances were sharp and believable. In fact, they were so good I found myself being absorbed into the characters, and not mentally taking notes about what I particularly liked about the performance. In the lead positions were Larry Cedar (FB) as C.P. Ellis and Tiffany Rebecca Royale (FB) as Ann Atwater. As I said, both were uniformly excellent and believable in their characters. In fact, my only quibble is a very small one: in Cedar’s bio, he lists “Discord: The Gospel According to Thomas Jefferson, Charles Dickens, and Count Leo Tolstoy” (FB) and talks about it’s world premiere at the Geffen. However, we saw him in it in the production before the Geffen: back in 2014 when it was at the NoHo Arts Center — which was the real world premiere. LA’s intimate theatre strikes again! But performance-wise, there are none. From the first time you see Cedar in his red KKK robes to the first time you see Royale taking off her shoes, to the last time at the funeral — these actors embody these characters with a strong spark and life. Rounding out the leads was Shon Fuller (FB) as Bill Riddick. This was a different level of lead. He was the catalyst of the story, although it is unclear to what extent he was a true catalyst (which are unchanged by the reactions). His was the voice of reason that introduced, tampered the reaction when necessary, managed the distance, and enabled the result to come across. We had the chance to talk to Mr. Fuller after the show, and you could just get the sense that this was a role he loved — that the message and story that came across in this play was one he wanted to get out there. In a smaller, but still critical, role was Holly Hawkins (FB) as Mary Ellis. Hawkin’s performance as C.P.’s wife humanized him — it got to show the family side and the family problems, and it also demonstrated how there could often be caring from that community as well. A small performance, but a critical one. At times, there were voices in crowd scenes and voice-overs. Crowd and choir sounds were from: Ben Hawkins, John Favreau, Taylor M. Hartsfield, Elyssa Alexander, Madeline Ellingson, Matthew G Wicks, Dylan David Farrs, Katie Lee, Connie J Kim, Jesus Manuael R., Lacey Beegun, and Joshua Johnson. Voice-overs were by Wyn Mareno and Sarah Ripper. I’m not going to link them as I usually do. The technical side of the staging was simple. The scenic design by David Potts was simple: an area for projects against a wooden structure providing a central area and two side entrances, with simple tables and chairs that could be moved around. These were augmented by properties by Colony regular John McElveney (FB) which established the sense of place and time. Sense of place was also established by the excellent projection designs of Dave Mickey (FB) and the scenic art of Colony regular Orlando de la Paz. The sound, also by Dave Mickey (FB), provided the necessary effects (including the necessary reverb from the podium microphones, when they were used). The lighting design by Jared A. Sayeg (FB) conveyed the mood well. Much of the lighting was stark, but I did notice the mood lighting behind the projection, and the heavy use of red lighting in some of the KKK scenes to create the appropriate sense of horror and foreboding. The costume design by Dianne K. Graebner (FB) combined with the wigs and hair of Rhonda O’Neal to support the place and time well. Remaining technical credits: Leesa Freed (FB) was the production stage manager. Casting by Patricia Cullen. David Elzer/Demand PR (Public Relations). The Colony is under the artistic direction of Barbara Beckley. 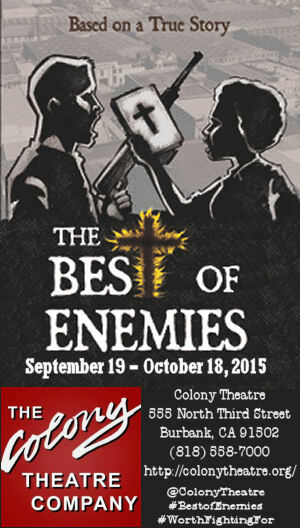 The Best of Enemies continues at The Colony Theatre (FB) through October 18. Tickets are available through the Colony website. It does not appear that the Colony has listed discount tickets through Goldstar for this show. Similarly, although they are listed on LAStageTix, discount tickets are not available. Upcoming Shows: October was being held for the NoHo Fringe Festival (FB); they’ve finally announced some shows but nothing yet is of interest. Given their delays, I started booking weekends with non-fringe shows. Next weekend takes us to Thousand Oaks for “Damn Yankees” at Cabrillo Music Theatre (FB). The fourth weekend of October brings “Uncle Vanya” at Antaeus Theatre Company (FB) in North Hollywood. Halloween weekend sees me at CSUN for Urinetown, and then both of us out in Simi Valley for “The Addams Family” at the Simi Cultural Arts Center (Simi Actors Rep Theatre (FB)). The following weekend sees us back in Simi for the Nottingham Festival (FB) on November 7. We then go out to Perris for “A Day Out with Thomas” at Orange Empire Railway Museum (FB) on November 11 (I can’t skip seeing my buddy Thomas and his friend Percy). The bookings for November conclude with Deathtrap at REP East (FB) on November 14; the rest of the month is currently open. December brings “Humble Boy” at The Colony Theatre (FB) the first weekend, followed by a mid-week stint as a producer, when we present The Nigerian Spam Scam Scam as the dinner entertainment at the Annual Computer Security Applications Conference (ACSAC). December also has dates held for “The Bridges of Madison County” at the Ahmanson Theatre (FB) and “If/Then” at the Pantages (FB). There are also a few other interesting productions I’m keeping my eyes open for. The first is the Fall show at The Blank Theatre (FB), “Something Truly Monstrous”, sounds wonderful — however, it runs through November 8, so squeezing it in would mean a double weekend. The show at the Kirk Douglas Theatre (FB) also sounds like an interesting exploration of clutter — but “The Object Lesson” only runs through October 4, and I’m not sure we can squeeze it in. As always, I’m keeping my eyes open for interesting productions mentioned on sites such as Bitter-Lemons, and Musicals in LA, as well as productions I see on Goldstar, LA Stage Tix, Plays411.